Dino fans will come stampeding over when they see this Triceratops Dinosaur Pinata at a birthday bash. 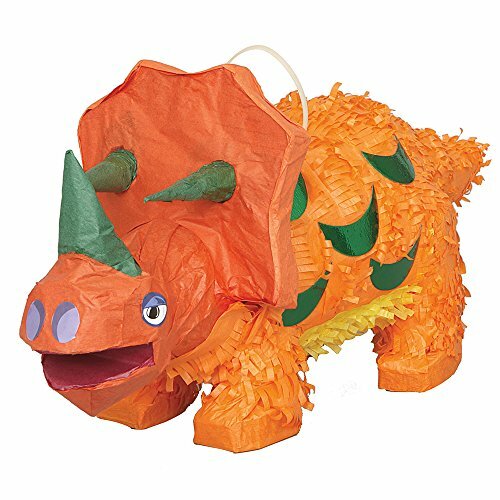 Shaped just like kids’ favorite pointy-headed dinosaur, this pinata is sure to have everyone roaring with excitement at a little boy’s dinosaur birthday party. Just hang this pinata from the ceiling inside, or from a sturdy tree branch outside for an outdoor activity. Then, have little ones line up and take turns hitting it with a stick or a pinata bat to try and break it open to release the tasty treats inside (sold separately). With enough room inside to fill with up to 2 pounds of the birthday boy’s favorite candy, this pinata is sure to be a hit with prehistoric partiers when it’s time for the games to begin.